Doesn't that look worlds better than yesterday's display? I fiddled around a little this evening and made some progress. I learned just enough about shell scripts and pngcrush to edit a file and end up with the correct display. I even modified the python file so that it finally reflect the proper longitude and latitude for where I live. 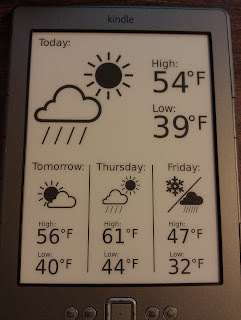 Now, the reason I say tomorrow's forecast is because the Kindle currently thinks it is 1:40am, which means Tuesday's forecast is under today, Wednesday under tomorrow and so on. There is no option to set the time in the device settings. My options are to register the Kindle with Amazon or edit the time from the command line. I don't really want to register a second Kindle device to my account because I don't have any intention of using this as an eReader and I don't want to accidentally send books to it. I've already done that with the tablet and the Kindle. It sounds silly but I'm really just trying to avoid clutter in my Amazon account. So edit via the command line is the likely course of action. 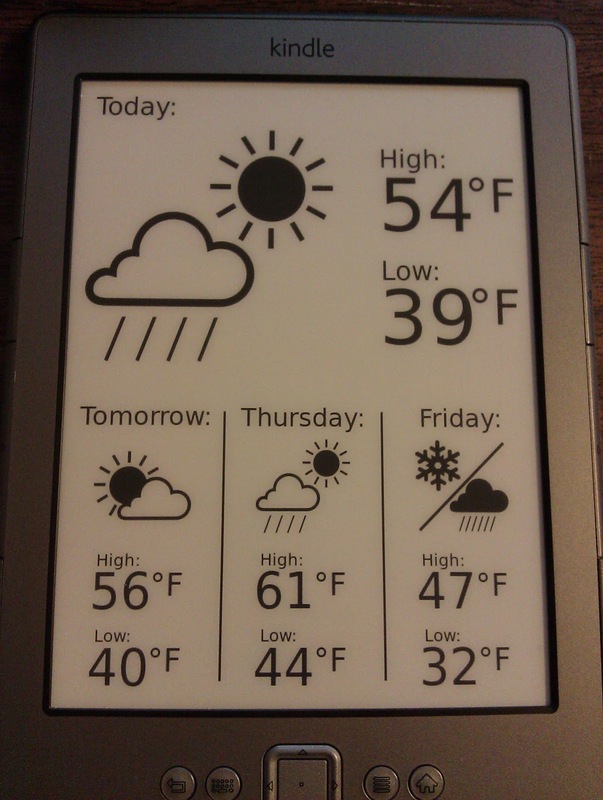 This may not be the perfect Kindle Weather Display yet, it's getting there. Plus I'm learning all sorts of new things along the way. Next I'll have to edit the refresh time on the web server and the Kindle with the use of cron. There are a few other tweaks I'd like to make after that, but I think once I have the refresh times set up I should be in good shape. I may end up running the web server (currently running the python code and converting SVG files to PNG files) on a Raspberry Pi until I figure out how to move everything to the Kindle. And yes, I'll eventually blog about something other than the Kindle. I just figured this might be marginally more interesting than reading about playing the Lost Shores content recently added to Guild Wars 2, which I've played a lot of.